My days are busy lately--getting ready for the book's pubbing, researching for a grant and my semester project, general school work, and work work. Plus my life. It's leading to a bunch of days eating Oreos, avocado toast, peanut butter sandwiches (from PB & Co, naturally), and I'll admit to the lunch that consisted of Snickers and a handful of peanuts. Yesterday, after doing research on Gourmet in Fales, I found myself running uptown for work. And I was famished. And there was Eataly. And 'Eataly's so expensive, I can't find anything cheap there,' or so I thought. I walked past the cafe, past the fancy desserts, past the fish, past the rotisserie chicken, past the meat, past the restaurant, and stopped at the focaccia. Something simple, something filling, something mildly nutritious like vegetable focaccia. 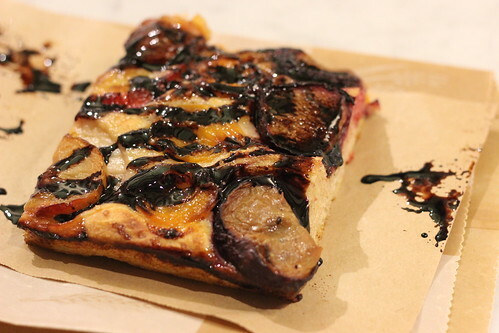 And I almost got the eggplant and tomato focaccia they had out for samples, until the man behind the counter told me they had apricot and plum focaccia. It's just that point in the winter where I miss every single aspect of summer. I'd give anything to be in 100+ degree heat right now with my flip flops and shorts eating fresh fruit I bought at the market. Bonus points for the balsamic glaze drizzled on top, though it did make my hands all sticky like I'd just eaten an ice cream cone. And it was all under $4.